As you may or may not know, Seemore Green is slated to be moved by 2015 from its current site to a spot behind the computer science building (there will be many more updates about this). A few projects have already started; the cold frames have come and gone, a couple of fruit trees have been planted, and a shed has been built. Timber framing, also known as post and beam construction, is a building technique that dates as far back as Neolithic times and continues to provide unparalleled beauty and stability. The style features heavy timbers held together with mortise and tenon joinery and wooden pegs, rather than conventional metal fasteners such as nails. Historically it has been practiced throughout the world in varying forms, including the half-timbered style of Northern Europe and the many timber traditional Japanese style. The garden shed design itself is based on the traditional Ontario barn style of timber framing with some subtle design flourishes. 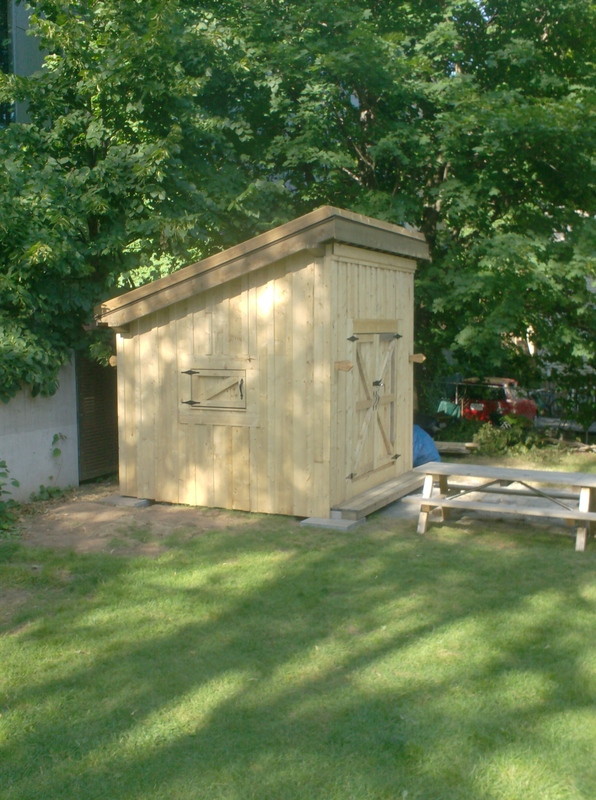 The 6” x 6” Eastern Hemlock timbers that compose the garden shed frame were provided by a small-scale family forestry operation in Westchester, Nova Scotia. Hemlock is a long-lived coniferous species native to the local Acadian Forest. Capable of growing for 400 + years and to heights of 100+ feet, it is an awe-inspiring tree when let to grow to maturity. There is a bit more work to do on the shed, putting on eco-sealant and installing the green roof. It would be awesome to have some helpers for this and installing a green roof should be a great learning experience. I’ll keep you posted on when this will happen but most likely sometime soon. Come see a movie in a garden…about a garden! This Monday the 19th at Seemore Green (1411 Seymour St.) Films on Critical Issues, as a part of NSPIRG’s Alt 101 will be screening The Garden. Bring blankets, chairs, and snacks! The fourteen-acre community garden at 41st and Alameda in South Central Los Angeles is the largest of its kind in the United States. Started as a form of healing after the devastating L.A. riots in 1992, the South Central Farmers have since created a miracle in one of the country’s most blighted neighborhood…s. Growing their own food. Feeding their families. Creating a community. But now, bulldozers are poised to level their 14-acre oasis. The Garden follows the plight of the farmers, from the tilled soil of this urban farm to the polished marble of City Hall. Mostly immigrants from Latin America, from countries where they feared for their lives if they were to speak out, we watch them organize, fight back, and demand answers: Why was the land sold to a wealthy developer for millions less than fair-market value? Why was the transaction done in a closed-door session of the LA City Council? Why has it never been made public? And the powers-that-be have the same response: “The garden is wonderful, but there is nothing more we can do.” If everyone told you nothing more could be done, would you give up? just a reminder about the Community Garden Bike Tour tomorrow. We will be meeting at Seemore at 1 pm and biking, rolling, skating, whatevering through the south and north ends of halifax to check out all the cool community gardening happening, including a beehive! Garden Bike Tours, Garden Movies and More!!! Thanks to all the super-duper volunteers who helped out at the Groovy Garden Gathering at The Oaks on the 25th! The show was lots of fun and there were no casualties from the hot-pepper eating competition (thank goodness!). I would like to introduce Xander Gopen who is the SeeMore interim coordinator this fall (if you haven’t already run into him digging in the dirt). He will be around for the awesome upcoming events and workshops, so talk to him if you want to get involved with the new or old garden spaces. 1) Workshop Series ‘the sexiest grocery store is my garden’ September 7th and 8th, 3-5pm at The Oaks (5920 Gorsebrook). 2) SeeMore Garden Open Hours September18th, 1-4pm at 1411 Seymore St.
3) ‘The Garden’ film screening outdoors (in the garden!). September 19th, 8:00pm at 1411 Seymore St.
4) Community Garden Bike Tour September 17th, 1:00pm at 1411 Seymore St.
Hilary will be talking with us about why it is better to eat live food, how to enjoy food with your senses and the specific benefits of certain foods found in the SMU Community Gardens. We will finish by harvesting some fresh veggies to make and share a delicious salad of all local ingredients! With the rising costs of food and questionable quality of food at some grocery stores, more and more of us are entertaining the idea of growing our own. Container gardening is a simple and easy way for folks living in the city to get creative and use what limited space and materials they have to grow your own food all year round! You may have heard of soil as a living organism… and it’s the truth! Soil is full of all sorts of interesting microbial activity. Critters in the soil eating, sleeping, travelling, communicating, and making babies makes for healthy and alive soil that is an important foundation for the plants you want to grow. 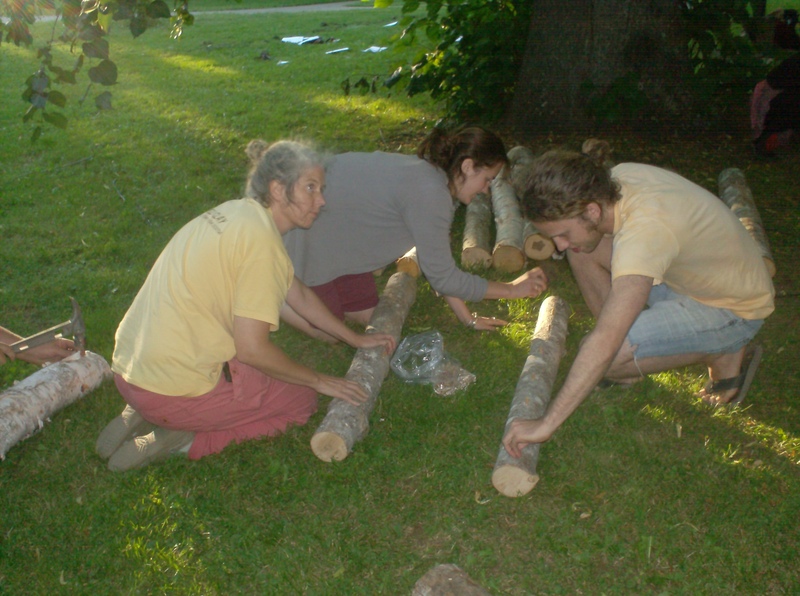 Jayme Melrose, Halifax’s Garden Doula, will guide us in a discussion about soil health, mulch, and compost as we explore the garden and actually build compost in the Oaks to be used next summer! Mushrooms have amazing potential to heal the environment and make our plants grow big and strong! Join us as mushroom man Adam Leblanc explains to us how mushrooms play a vital role in the garden by breaking down woody materials, leaving behind tasty nutrients for our plants! Then we will create a home for Wine Cap mushrooms in the garden that will benefit the plants and soil and we can eat them too! September18th, 1-4pm at 1411 Seymore St. Want to garden with friendly people and share ideas? Meet at the garden for a tour and take home some yummy produce! All ages, abilities and backgrounds are welcome. September 17th, 1:00pm at 1411 Seymore St. Bring your bike, scooter, roller skates, skateboard or longboard to discover some of the beautiful green wonders of Halifax. 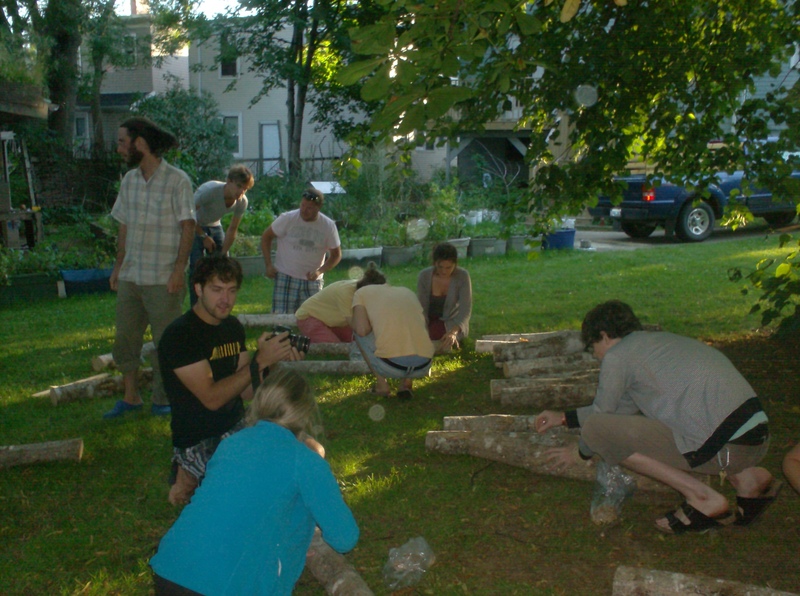 We had a great workshop with Adam Leblanc making mushroom logs! We adventured out into the land of the South Shore to pick up some freshly cut hardwood logs. The were to be soaked overnight so that the plugs would not dry out (thanks Nova Scotia weather….). le of bags of inoculated plugs we hammered in with bricks. 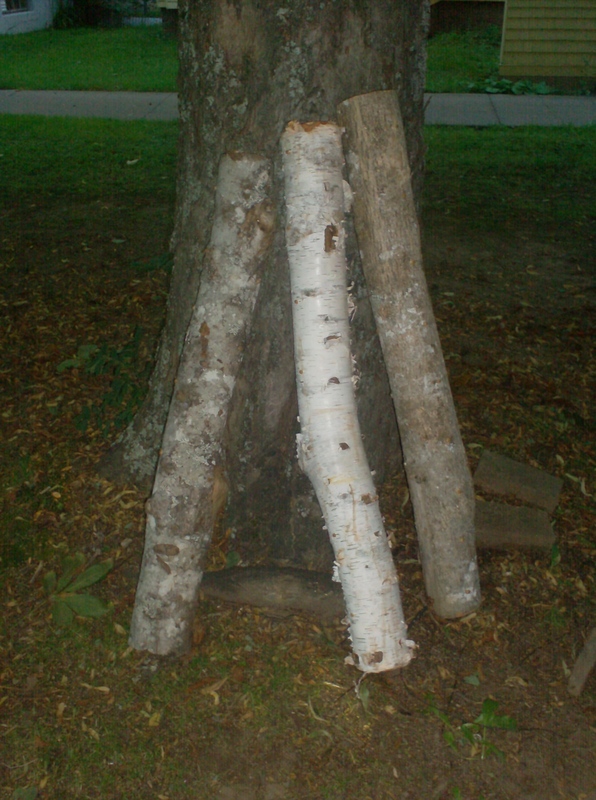 We put a layer of wax over the plugs, and now they are waiting in the shade over the winter so that the logs can become completely colonized. In the spring, they are supposed to produce mushrooms every couple of weeks, after which you dunk them in water to start the process over again.